The Yukon Legislative Assembly is the legislative assembly for Yukon, Canada. From 1900 to 1978, the elected legislative body in Yukon was the Yukon Territorial Council, a body which did not act as the primary government, but was a non-partisan advisory body to the Commissioner of the Yukon. Following the passage of the Yukon Elections Act in 1977, the Territorial Council was replaced by the current Legislative Assembly, which was elected for the first time in the 1978 election. The Yukon Legislative Assembly is the only legislature in Canada's territories which is organized along political party lines. 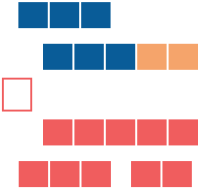 In Nunavut and the Northwest Territories, the legislative assemblies are instead elected on a non-partisan consensus government model.